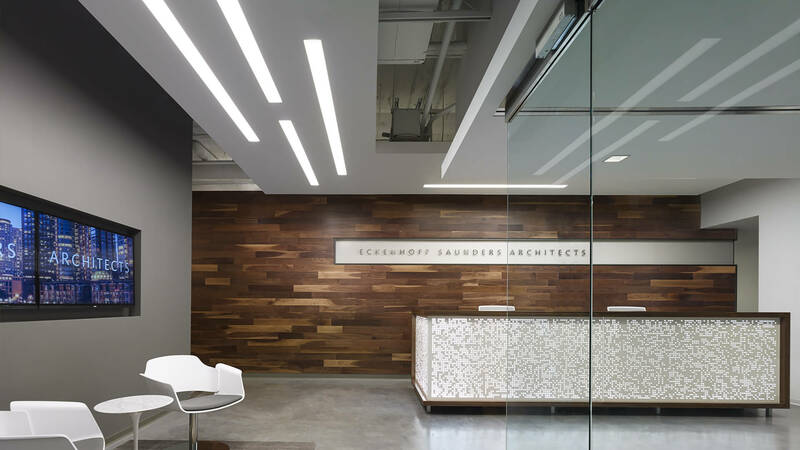 At the new year, ESA relocated from a West Loop loft building to One Prudential – reducing their footprint by 1/2, while still allowing room for growth. The new space was designed to support a collaborative and communal workplace environment while, most importantly, to be a place of creative inspiration. What ESA was lacking in their former space, the new address delivered ten-fold: natural light and million-dollar views. The Lake, Millenium Park and Michigan Avenue can be easily appreciated and because of this, the interior architecture had to support the views, not compete. Upon entering ESA’s suite, the reception area is small in footprint, but delivers a front-door impact. LED panels serve as both signage and as a scrolling portfolio of ESA’s work. The reception desk’s perforated backlit panels are a matrix pattern, symbolizing development and form. The matrix pattern also complements the linear LED recessed lighting above and the linear walnut planks behind the desk. The openness, views and natural daylight of much of the space were preserved by locating all the workstations (each a sit/stand) along the perimeter windows while supporting office elements were located at the core. The core volume is comprised of such office functions as: Mail/Print, Library and the Townhall. These active spaces are all located in the walnut clad volume and act as the hub of ESA.